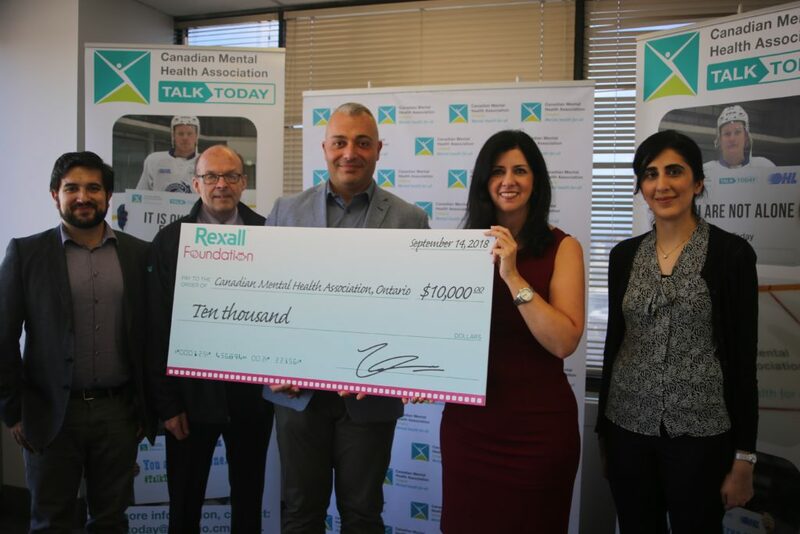 (Sept. 17, 2018, Toronto) – The Canadian Mental Health Association (CMHA), Ontario Division would like to thank the Rexall Foundation for its $10,000 donation to Talk Today, a program which promotes positive mental health and provides suicide prevention education to amateur athletes, including Canada’s top junior hockey players. This donation will be used to support Talk Today workshops and help raise awareness amongst athletes and fans about the importance of speaking openly about mental health and suicide. Over the past four years, the Talk Today program has trained over 3,000 athletes, coaches, staff and parents about how to acknowledge signs of suicide, where to seek help, and how to connect others to suicide first aid resources. Through Talk Today, athletes and sports organizations are also connected to local CMHA branches where they can access mental health resources, seek referrals to community mental health and addictions support or crisis intervention services. The Rexall Foundation has been helping build strong and vibrant communities by supporting numerous charitable organizations since 2002. Whether it’s a community or children’s hospital or a disease prevention organization, the Foundation values the role it plays in helping the delivery of numerous programs and services in Canada. In 2018, the Rexall Foundation has already donated over $ 736,069 to 65 charitable organizations that promote the health and wellness of children and seniors, including charities in Ontario, such as Easter Seals Ontario, Holland Bloorview Kids Rehabilitation Hospital Foundation, Hospice Wellington, Project AIM Programs, Geneva Centre for Autism Foundation, plus many more local and national charities across Canada.